It is known that aging is largely a result of the effect of free radicals on our body cells, and that green coffee bean extract can be used to fight against these. While we intuitively understand what the term 'aging' means, very few people can actually describe it in words, although there are several theories of why it occurs. The most viable of these include the Error Catastrophe Theory, related to faulty molecular transcription and errors in cellular function, the Crosslinkage Theory, in which progressively increasing cross-linking between proteins slows the body functions down, and the Neuroendocrine Theory, in which changes in homeostasis and hormone levels occur through time due to an increasing loss of sensitivity of receptors to feedback inhibition. However, by far the most acceptable and best understood theory is the Free Radical Theory of Aging, which green coffee beans have been found to help fight, and it is on that which we shall focus here. Free radicals are oxidants created by unpaired electrons. Electrons generally go around in pairs, but occasionally molecules lose one of these electrons, creating a situation where it possesses an unpaired electron. In this condition, that molecule has only one purpose in life and that is to oxidize other molecules by stealing an electron from them. Oxidation can cause untold damage to cell membranes, and also to other molecules that are vital to life, such as DNA. The end result is aging, and the onset of many diseases and conditions connected with aging. Free radicals are believed to be behind inflammatory diseases such as arthritis and Crohn's disease, strokes, cardiovascular disease, Parkinson's disease, Alzheimer's disease and cancer among many others. Each of these is associated with aging. 1. Energy is generated by the intercellular mitochondria by the production of ATP (adenosine triphosphate). By-products of the mechanism by which this is done include hydrogen peroxide, the superoxide anion, and a hydroxyl radical. Over 20 billion molecules of antioxidant are produced in each individual cell daily, and every one of these has the capability to do damage to your body. The figure for inefficient cell metabolism is significantly higher. 2. Peroxisomes are eukaryotic cell components that contain oxidative enzymes, whose function is to produce hydrogen peroxide that is then used by another enzyme, catalase, to oxidize other toxic substances. It is used by the liver, for example, to oxidize about a quarter of all the alcohol we drink to acetaldehyde, and also to remove other toxins from the body. The down side is that the hydrogen peroxide can escape and degrade the cell membranes. 3. Chronic infections give rise to a high activity of white blood cells, which utilize oxidants of various kinds to destroy viruses, bacteria and parasites. These include hydrogen peroxide, superoxide and nitric oxide which can also destroy the cells they are protecting. 4. Cytochrome P450 is an enzyme used to clear the body of toxic chemicals in our food such as pesticides and drugs. They also give rise to oxidative by-products. In addition to these, free radicals are also produced by air pollution consisting of smoking, factory emissions and traffic fumes. Trace metals such as lead, iron and copper, are rich free radical sources, as is the ultraviolet component of sunlight, and caffeine, from tea and coffee, can also contribute to the store of free radicals in your body. So where does green coffee extract come into this, and how should it be used. Free radicals tend to react very rapidly to accelerate aging, and in order to counter them, and hold the effects of aging at bay, it is necessary to destroy them almost as quickly as they are produced. This is carried out by antioxidants, of which there must be a plentiful supply available in each body cell. Antioxidants donate electrons to free radicals, and so effectively neutralize them before they can attack the membranes of the cells in your body, or any of the other tissues that they can degrade. Many of the vitamins have a powerful antioxidant effect, among them vitamins A, C and E. Other antioxidants available in our diet include beta carotene and other carotenoids, flavonoids and glutathione, and also cofactors such as lipoic acid. All of these can destroy free radicals by the donation of an electron. Green coffee beans have also been found to possess a strong antioxidant effect, due largely to the plant phenols, such as caffeic acid that forms chlorogenic acid with quinic acid, both cholorgenic and caffeic acid being string antioxidants. Green coffee bean extract is standardized to 99% chlorogenic acid. This substances not only reacts rapidly with free oxygen radicals but also helps to prevent to formation of hydroxyl radicals. It has been established that green coffee bean reacts twice as fast as green tea or grape seed extracts, and speed of reaction is critical in the destruction of free radicals that have to be destroyed before they do damage. Other antioxidants found in extracts of green coffee beans include heterocyclic compounds such as pyrroles, furans and maltol. 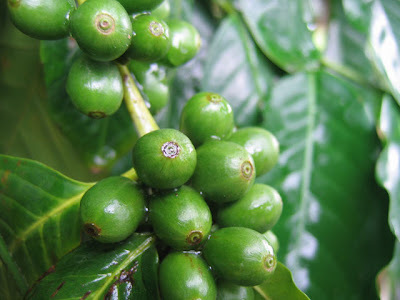 The extract is made from beans of Coffea Arabica, this containing higher concentrations of chlorogenic and caffeic acids than the Arabica plant. The extract is also produced to be naturally low in caffeine, thus avoiding the negative effects of drinking coffee for its stimulating properties. When the green coffee bean is roasted, the antioxidant effect is found to decrease, and after roasting and brewing both the Arabica and the Robusta beans have reduced in activity to much the same level. Studies on some of the conditions exacerbated by free radicals have indicated the effectiveness of green coffee beans as an antioxidant. It is believed to help reduce atherosclerosis caused by the oxidation of low density lipids (LDL). Oxidized LDLs tend to be easily absorbed by phagocytes to form plaques and foam cells in artery walls, thus narrowing and hardening the arteries, causing a deprivation of oxygen and nutrients to the heart and also increased blood pressure. Antioxidants from the green coffee bean prevent this from happening, and so help to reduce this serious effect of aging. A good supply of antioxidants will also prevent the cell membranes from being destroyed, one effect of which is to age the skin. Antioxidants in the form of green coffee bean extract can help to maintain a youthful appearance while also aiding in the prevention of the more serious effects of free radicals that can shorten life. There are no doubts that free radicals contribute significantly to accelerated aging, and that the antioxidants contained in green coffee beans can help hold back the physical signs of aging, while also helping to destroy those free radicals that threaten life by promoting cancer, atherosclerosis, and other similar conditions.